Renowned pianist Geri Allen performs on a Yamaha Disklavier at UC Davis. Her performance was recreated on Internet-connected Disklavier pianos in San Francisco and in Miami. 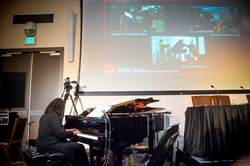 "Not only does Remote Lesson technology represent an entirely new and liberating way to create equity and access to diverse audiences, it also brings musicians closer together over long distances into one collaborative musical space," said Geri Allen. Musicians in three locations – University of California (Davis, Calif.), SFJAZZ (San Francisco) and New World Symphony (Miami) – performed together simultaneously, in two time zones, in a single, extraordinary live musical event, thanks to Yamaha Disklavier Remote Lesson technology. This “co-located” performance on Tuesday featured renowned pianist and educator Geri Allen, who performed live in Davis; Chris Chafe of Stanford's Center for Computer Research in Music and Acoustics (CCRMA), who played cello from the New World Symphony in Miami, and the SFJAZZ High School All-Stars, who performed in San Francisco. The presentation also highlighted the use of the CENIC network by SFJAZZ, and its potential for other cultural organizations to use the network. Remote Lesson technology, developed by Yamaha, makes it possible to connect two, three, or even four Disklavier reproducing pianos via the Internet. When a teacher, performer, or student plays a Disklavier using this technology, each remotely connected Disklavier produces precisely the same key and pedal movements in real time. Allen performed on a Yamaha Disklavier at UC Davis, and her performance was recreated on Internet-connected Disklavier pianos in San Francisco and in Miami. The artists in the remote locations played “live" with Ms. Allen, and audiences in Miami and Davis were able to experience her actual performance in other cities – live and in real time – watching on large-screen monitors behind the artists onstage. The latest models of Disklavier can also be connected to one another via the Internet. Once connected, the performance information can be transmitted from one instrument to the others – and be immediately reproduced with perfect precision, even on the other side of the globe. To learn more about Yamaha Disklavier Remote Lesson technology, visit http://4wrd.it/YAMAHAREMOTELESSON.